As an illustration of just how much the photography bug has bitten us both, he didn’t even hesitate before deciding on a new lens of some sort. He spent the next month pouring over reviews, price lists, etc… before settling on a few items. 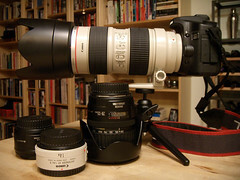 We got the 70-200mm lens and 1.4 extender today. Yipee!!! Neither of us can wait to use it. The only thing that worries me (slightly) is the weight – daaaaaang, is that whole thing heavy. Lucky a monopod is on its way! I’m not sure if I mentioned that over the winter, I bought a digiscope adapter to attach my Nikon Coolpix to my spotting scope. Last year, I managed to get one or two digiscoped pictures by holding the camera up to the eyepiece of the scope and attempting to stand very, very still. That technique wasn’t only highly difficult, but it produced so few usable pictures as to be useless. I vowed to get a digiscoping rig and found on from Eagle Optical that works fine. This is going to be a BIG learning curve for me this year. Let’s hope I get some usable pictures! ~ by Steph on April 1, 2008.